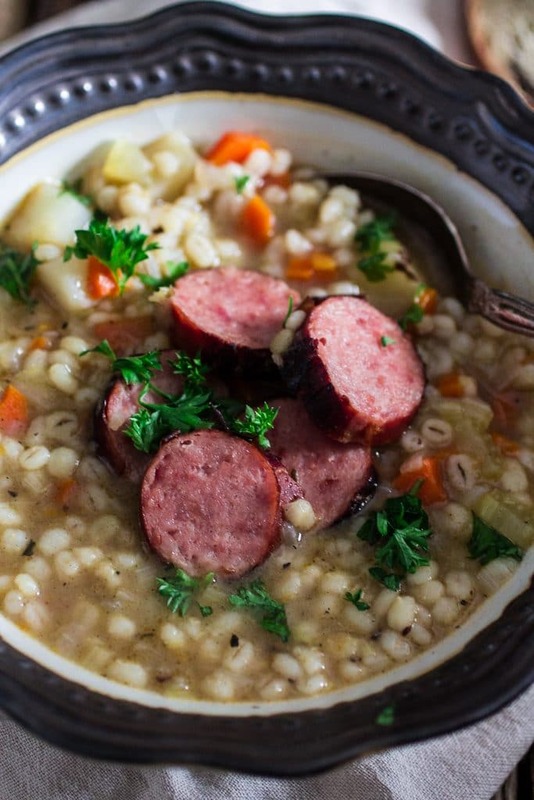 A classic and filling barley soup with kielbasa sausage! Comfort food at its best! Oktoberfest might be over in Germany, but it is still very much alive in my heart (and in some bars in NYC)! 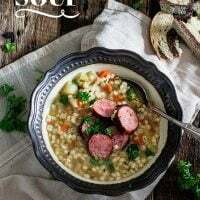 So I decided I was going to share another classic German recipe: Graupensuppe, or Barley Soup in German, which I made with veggies, barley, bacon and, of course, sausage! ? My husband went CRAZY over this soup. I originally planned on freezing half of it, just because we (mostly me!) get sick of eating the same leftovers after a while, but then I noticed 2/3 of the soup was already gone. As I told you earlier last week, Tim and I were both feeling a bit under the weather. All we wanted to do was snuggle in bed with a bowl of comfort food, watching silly TV shows. I mean… that’s usually all we want to do even when we’re not sick. Yep, I have no shame in admitting we are a lazy couple and we would trade any night out for good homemade food + Netflix + my fluffy doggy warming up our feet. ?➕?➕?=? But anyways… I gathered all my (low) energy and went to the kitchen to make us this delicious soup. I considered using my slow cooker, but we needed the soup IMMEDIATELY, so no time to wait for it to simmer for 8 hours. Gladly, my part in this soup making business was only some browning and sautéing. The rest was the work of God, or science, or my amazing dutch oven. Whatever you want to believe! But guys, please don’t think I’m foolish. I know damn well why Tim loved this soup so much. 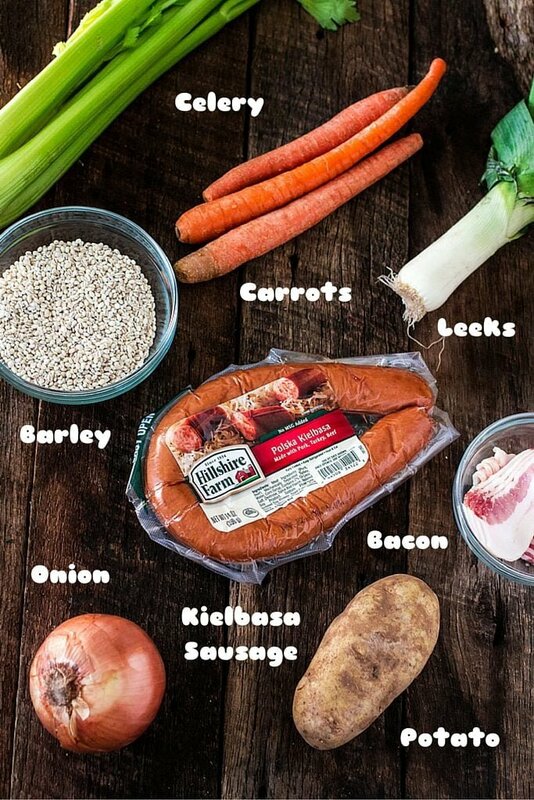 The Hillshire Farm® Polska Kielbasa. I mean, he would be happy with just eating the straight out of the packaging. I can’t tell you how many times we had “fights” because he ate the sausage I bought thinking of a recipe. Good thing I have a Walmart just down the hill and I can send him for some more whenever that happens. Thankfully, I now got into the habit of just buying more than what I need. Especially now with the colder weather, there’s no recipe that wouldn’t benefit with the addition of this delicious sausage. If I’m short on time, or forgot to think of dinner (mostly because I spent all day working on a dessert for the blog, for example), I just slice the Hillshire Farm Polska Kielbasa and sauté with onions until everything is perfectly browned. Then we use it for sandwiches or we eat it with rice! Along with a bottle of cold beer, of course. This post is Oktoberfest themed, after all! ? The barley and the sausage really make this soup very filling and a meal on its own. If you haven’t had the chance – or the time – to attend an Oktoberfest celebration this year, just make this soup and it’ll be as if you were there in Munich! In a large dutch oven, over medium high heat, cook the bacon and the sausage until browned, about 5 minutes. If necessary, add 2 tablespoons of butter. (You might also have to remove some of the bacon fat, if it's too much or if it looks burnt). Add the leeks, the carrots, the celery and the potatoes and cook until softened, about 5 minutes. Season with salt, pepper, oregano, paprika and nutmeg. Add back the bacon and the sausage. Add the chicken broth and bring the soup to a boil. Once it boils, lower the heat to low, cover and simmer for 45 minutes to 1 hour or until the barley and the potatoes are cooked. Remove the bacon and sausages. Discard the bacon and thinly slice the sausages. Serve hot, garnished with chopped parsley and the sliced sausage. I am so glad that Oktoberfest is still alive in your heart AND on your blog because this soup looks fabulous! Kielbasa sausage reminds me of my dad, he loved the stuff and passed that love on to me. So naturally I am totally digging this soup! This looks absolutely delicious and totally comforting! Can’t wait to try it! Cheers, lovely! This soup looks delicious, Olivia. So warming and comforting! Love the mix of flavours. Excited to give this a try soon! This soup looks fantastic, Olivia. I love barley, and this soup is the thing I can have everyday! So delish. Yummm… love this type of soup! Looks so good…and so do your photos! We have some fresh, Polish sausage, just looking for a home; fantastic idea here! Your pictures are beautiful. This soup looks perfect for winter! This looks so inviting and hearty. Perfect to have in bed. under the sheets. watching tv. Pinned, such beautiful photos! 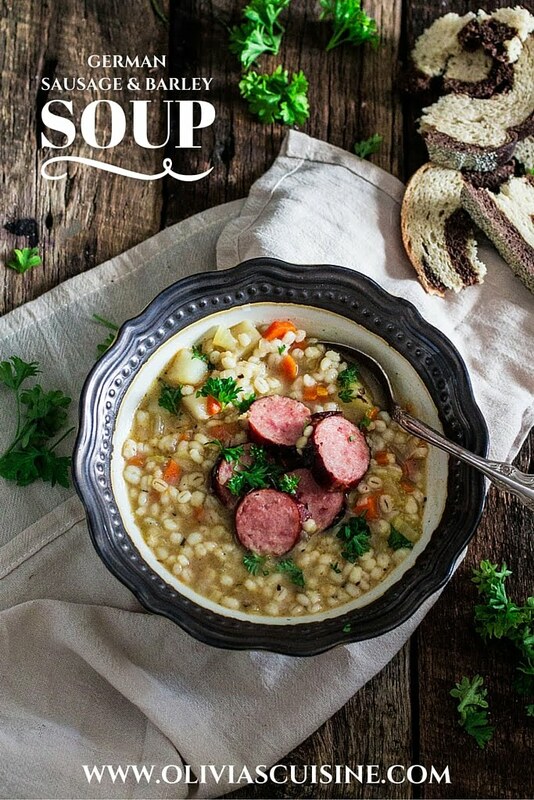 Perfect comfort food for this cooler weather….also happen to love barley…sausage is great too!! Pinned and yummed and put on the list to make ASAP. This sounds delicious, satisfying and perfect for fall! The photos are AMAZING too! Such a cozy flavorful fall soup! So many wonderful textures and flavors in this pot of goodness. What a savory and delicious fall soup! So wonderful for a chilly night! And your photos are beautiful! I made this soup the other night to use up some leftover barley I had sitting around, and truthfully the last time I had barley I didn’t enjoy it one bit, but this was AMAZING!! I’m vegetarian so I opted out the bacon and kielbasa for a package of veggie kielbasa by Tofurkey and swapped out the chicken broth for vegetable broth and kept everything else the same and followed the recipe to a T (minus the bacon of course). I served it with a splash of maggi and a tall glass of colaweizen and my fiance, family and friends loved it! I will definitely be keeping this recipe close by! This is a new favorite for sure! Beautiful photos! I am always looking for good soups and this will definitely be added to my collection. I made one change, I sliced the sausage into disk like shapes and gently browned on each side. I returned the sausage during the simmering time. This allows the flavors from the sausage to intensify and greatly enhance the soup. Thanks for sharing your wonderful recipe. I’m so glad you enjoyed, Renee! :) Thanks for taking the time to leave me a feedback! We went to an elegant German buffet at the college & they served this soup. It was just about the best soup my husband & I’d ever had. I looked at all the recipes online for the recipe & this was the one that mostly resembled it. Even though I loved the kielbasa they used, I don’t like the scary additives & preservatives. So, I used one of Trader Joe’s sausages & when the soup was done, it tasted exactly like the one at the college. I’ve saved this recipe as my favorite soup. Excellent flavor and easy to make! I love barley and it is so good for you. Thank you for sharing your recipe! Will be making this again and again! Loved the soup! Turned out great! Thanks for the recipe! Because I don’t eat pork, I made this with chicken smoked sausage and turkey bacon, and it was glorious! Oh my goodness. I reheated it the next day, and it was even better. Thank you for the recipe! I will be making it often. Thank you for sharing this recipe. We attended an Oktoberfest celebration and I wanted to do something other than pretzels, cheese, and beer. I followed your recipe exactly, with the only difference being that I used my Instant Pot instead of a Dutch oven. I sauteed everything directly in the Instant Pot and set it pressure cook for 15 minutes once I added the broth (which I did add 1 extra cup). It was a hit with my husband and other guests.